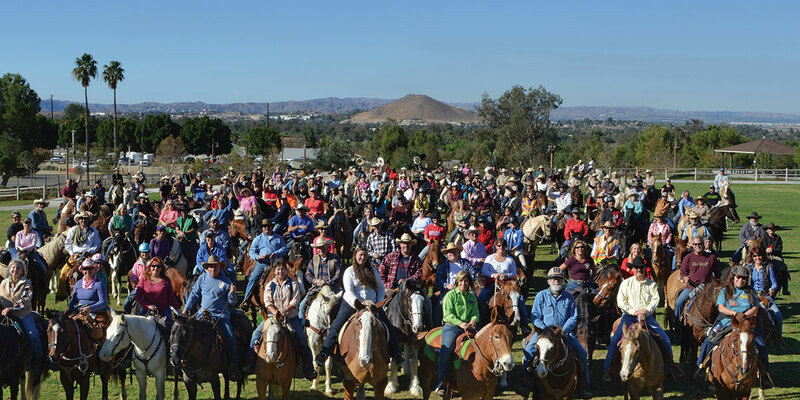 EDITOR’S NOTE: Longtime Norco resident Audrey Pavia, an award-winning author and avid horsewoman, shares a slice of life in her beloved community by taking us on one of her favorite routes. Norco residents pose for a 2013 community photo by photographer Brigitte Jouxtel at Pike’s Peak Park to commemorate an iconic Pedley Field Photo taken 15 years earlier. The sun is hanging low in the sky, and the gentle afternoon breeze has arrived. 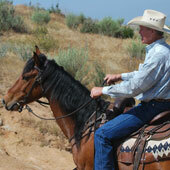 It’s time to saddle up my Spanish Mustang, Milagro, and go for a ride through Norco. I step outside my back door and Milagro whinnies to me. He knows the drill. I saddle him up and lead him to the front yard. We pick up the trail right across the street from my house. That’s how easy it is to go riding in Norco. We head south on the Hillside Avenue trail, passing an assortment of paddocks and driveways. Milagro takes a good look at a peacock perched on a fence in a nearby yard. He’s familiar with the flock of feral peacocks that live on this part of Hillside. He then glances up at a yard across the street, where a few alpacas, a miniature horse and two Haflingers are sharing their dinner. There’s always something interesting to see in Norco. The trail curves and we are on Third Street, headed toward Norco High School. We cross third and walk along the narrow dirt shoulder skirting the high school football field. The field is quiet today, and we pass without incident, turning right on Second Street. This is the way we need to go if we want to pass our first landmark for the ride: Disney’s Circle D Ranch. NORCO, CA – Memorial services were held at Nellie Weaver Hall Tuesday, Nov. 23, for Norco Mayor Malcolm Miller, who passed away Nov. 17 after battling with liver cancer that had been diagnosed in August. 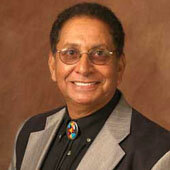 Dr. Miller, 65, a retired anesthesiologist, was in his first four-year council term after being elected in 2007. 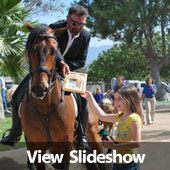 His gentle, intellectual manner were combined with a drive to preserve and enjoy his community’s equestrian lifestyle. He saw his role as one who could influence long-term implications of City Council decisions – and also prevent council members’ political differences over them to become personal. Two weeks before his death, he had announced that he would take a 10-week leave of absence to receive treatment. 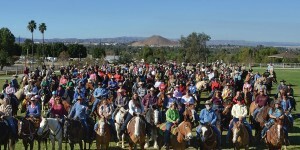 The City Of Norco’s official mascot, the Mustang “Hail Yeah”, celebrated his sixth birthday July 10 at Starbrite Riding Academy with 500 of his closest two-legged friends (above), ranging from well-wishing Norco councilmen and dignitaries to children with hand-made “Hail Yeah” dolls – as well as plenty of gift carrots (including carrot cake). To enliven the party, O.H. Kruse Feed and Alltech sponsored a Kentucky bluegrass barbeque with Tom Cunningham and his talented band. Scott Helms of Ramona won the raffle for tickets to the Alltech World Equestrian Games in Lexington, Ky., this fall. All proceeds benefitted the Compton Junior Posse, which received $1,729. O.H. Kruse sponsored the Compton Posse to attend a clinic with Hail Yeah’s trainer, Ray Ariss, in the morning before the celebration, which capped off a festive day at Starbrite Riding Academy. At right, Hail Yeah and his trainer, host Ray Ariss, receive a birthday present from Carson Badger, age 9, of Norco. 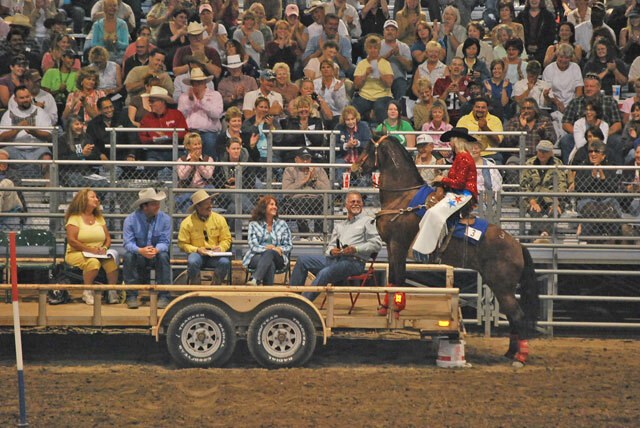 Gary Wedemeyer of Winton and The Deacon win the 2010 Extreme Mustang Makeover Trail Challenge in Norco May 14-16. NORCO — The Deacon, a well-made American Mustang trained by Gary Wedemeyer of Winton, seemed to come out of nowhere to preach a sermon on the talents of a wild horse with 90 days training. The 5-year-old gelding went on to take the win in the $9,000 Extreme Mustang Makeover Trail Challenge, held May 14-16. The Norco event encompassed more elements than any other Extreme Mustang Makeover held this season. 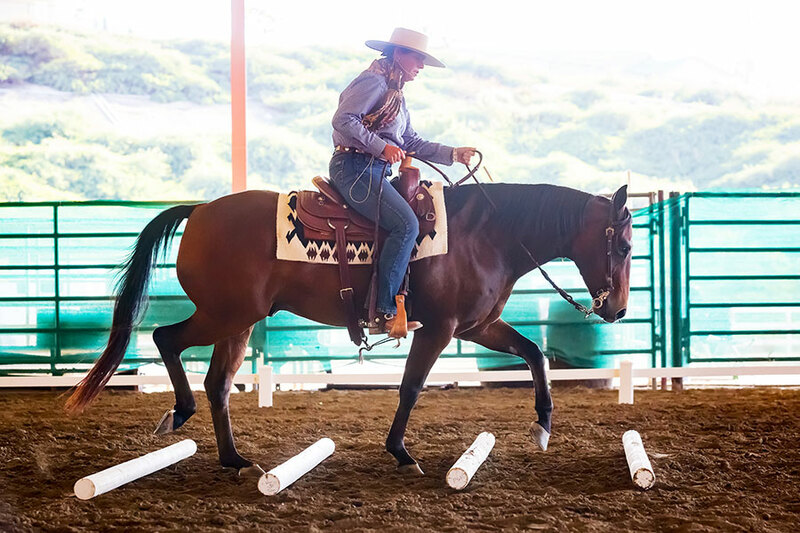 Not only did Mustangs and their trainers compete in the routine body conditioning, but also in hand and under saddle obstacle courses. How challenging was the four-mile trail course? I’m the mother — but I thought I’d share our story. 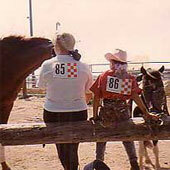 I was 29 and my daughter, Elishia, was 7 when we first got into horses – and we got her first pony. He was a Shetland Pinto, about 11.1 hand (good thing my daughter is very small … she’s still 5-feet-4 at age 26 today!) We named him Oreo since he was black and white. We were new to horses, and this was our first small ranch. It was a stormy, rainy night after we had rain all day. We only had partial covers, so Oreo was soaking wet. I felt so badly because my daughter Elishia felt so sad for her pony. So, thinking I was doing a good thing for Oreo and my daughter, I brought Little Oreo into my living-room, in front of the fireplace. My daughter was so excited, she got her blowdryer and we proceeded to blow dry him. Well, we got him all dry and fluffy. He looked happy. Then my husband came into the living room and said, “Well now that you got him all dry, when are you taking him back outside to his stall?” Oh, Oh. We didn’t think that far. We just thought we were doing a good thing for Oreo, and I thought I was doing a good thing for my daughter. But poor Oreo, all nice and warm and dry in our living room, had to go outside back to his stall with the partial cover to get all wet again. I think we made it worse. We will never forget that. Now, after owning horses for about 21 years, we know better. Now I have a 3-acre ranch with about 18 horses — some mine, some boarders — and all have full covers.I have made sure of it. Not a one will get wet in the rain. Ever. In fact, I think the horses I’ve raised are very spoiled and they do not even know what rain is. (Don’t know if this is good or bad.) But at least I know, and my daugher knows, forever on my ranch no horse will stand in the rain again! NORCO — The Extreme Mustang Makeover returns to Ingalls Park on May 14-16, and with it comes one of the most unique and challenging equine competitions in the country. 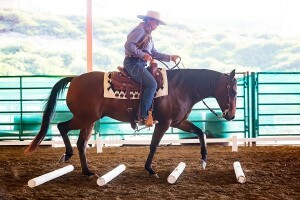 Trainers will compete for a part of the $10,000 purse as judges will evaluate each horse and trainer on body condition, groundwork, and how the horse maneuvers through an obstacle “horse course” that simulates trail and recreational riding situations.